I arrived in Edinburgh via train around 3pm in the afternoon on May 3rd. I didn’t really have any plans for my evening, so I decided to drop my bags off at the Airbnb I rented just south of George Street and head towards the Royal Mile. I had read about Greyfriars before I left Canada, and since it wasn’t on my itinerary for the rest of the trip, I decided to head in that direction. For a site that you can find in any tourist books, it’s wonderfully bare of tourists. And, oh! How wonderful this cemetery is. 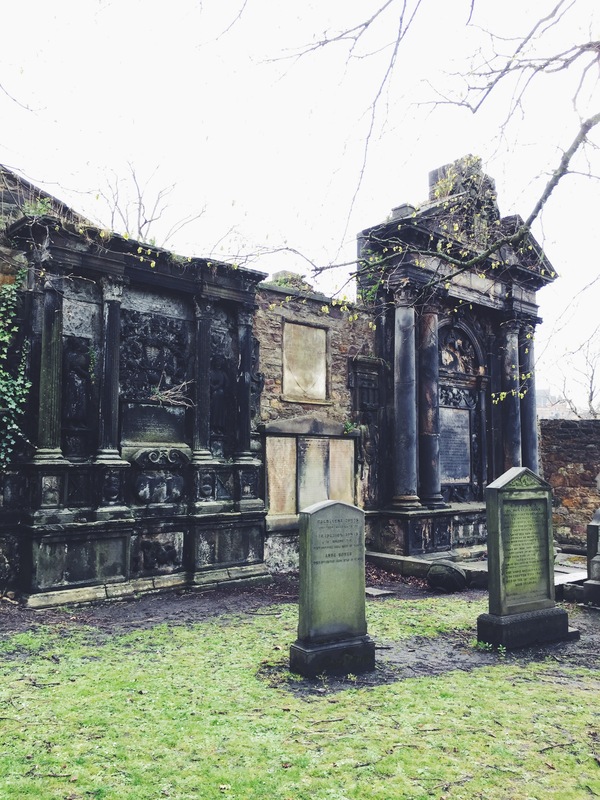 I’ve always had a fascination with cemeteries ever since I was a little girl (and I love walking through the Mount Royal cemetery every now and again) but no Canadian cemetery can even compete with Greyfriars Kirkyard. Greyfriars Kirk is one of the oldest buildings in Edinburgh. Completed circa 1620. 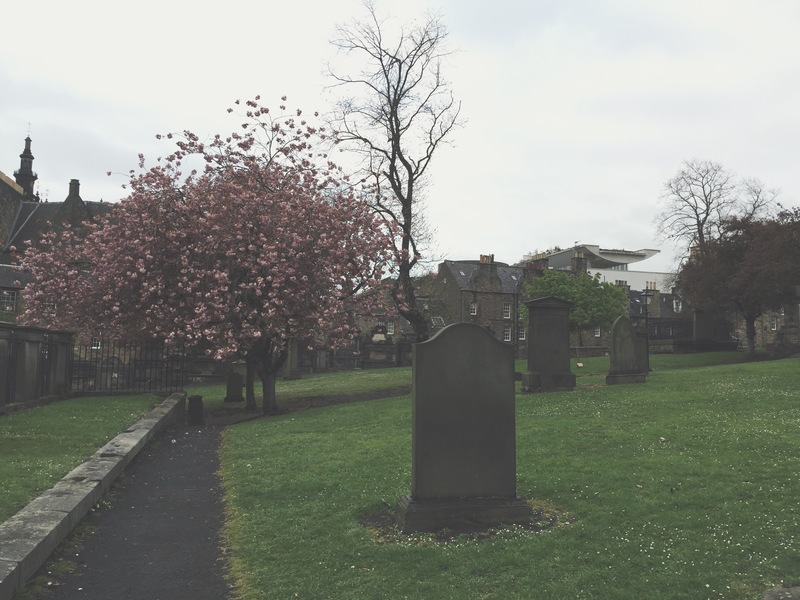 After the Franciscan monastery that had been on the property dissolved in 1559, the Edinburgh Council proposed the site for a graveyard due to the limited space at the Church of St. Giles. 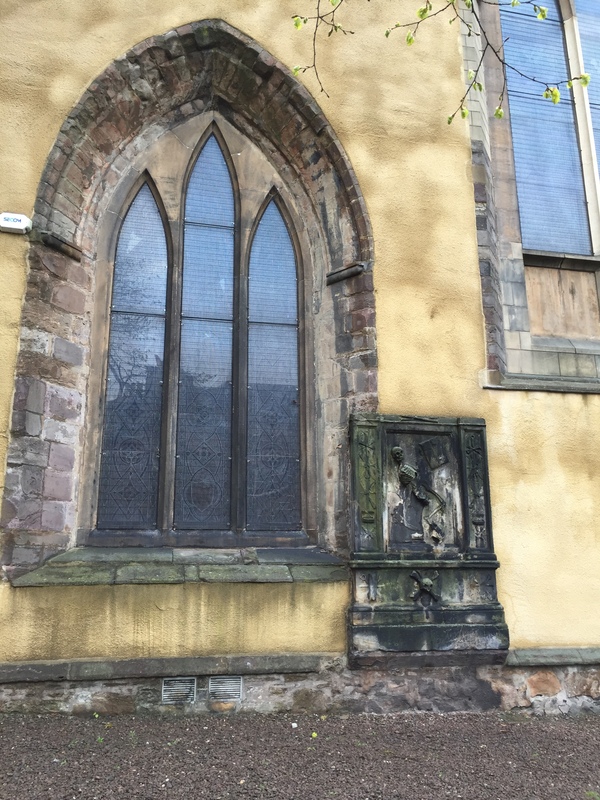 They stated that “the smell and inconvenience in the heat of summer” was taken into consideration when choosing the site, as Greyfriars is located off of what would have been the heart of the city in the 16th Century (today’s Royal Mile). One of the many tombstones in the Kirkyard. I lucked out because the clouds were holding onto their rain, so I didn’t get wet but they created a perfectly spooky atmosphere. Since I went to the UK in early May, I was also fortunate enough to see all of the trees in full bloom around the city. The kirkyard was full of beautiful blossoms. Blossoms and graveyards and ghosts, oh my! 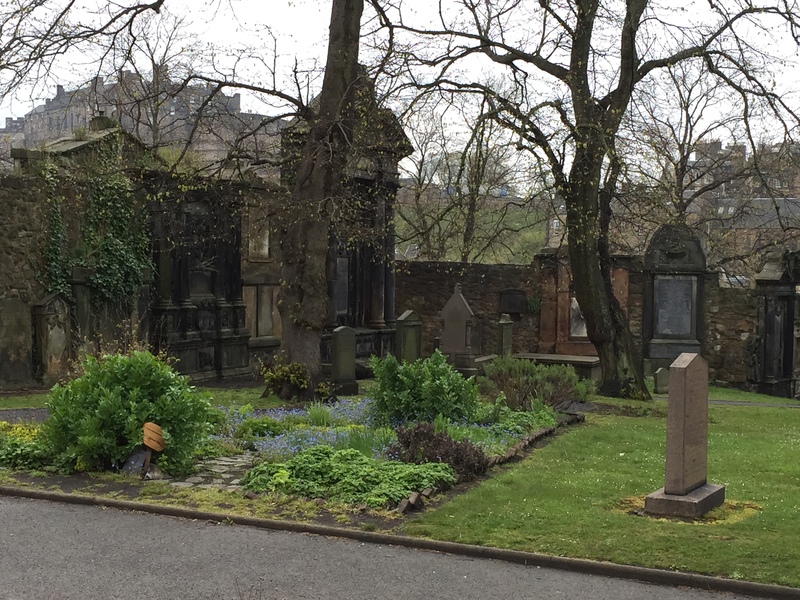 An interesting fact: According to my Edinburgh: The Dark Side tour guide (who is also a Quidditch captain IRL and wears a cape – true story), the people of Scotland do not have the same reverence for graveyards as we do in Canada. 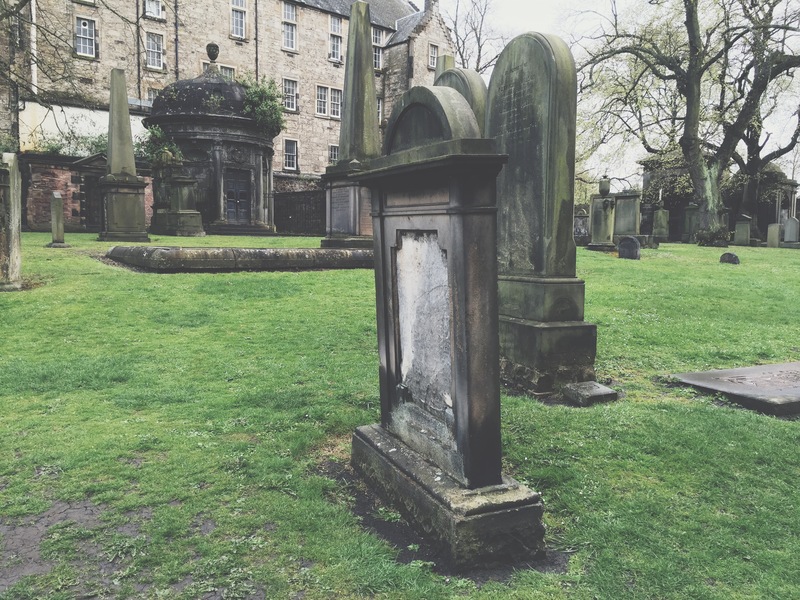 During the birth of Scottish cities, since there was so few green space people would gather in graveyards to play, picnic, or just contemplate life… and death. I saw quite a few people reading in the cemeteries, and even playing frisbee (go figure). 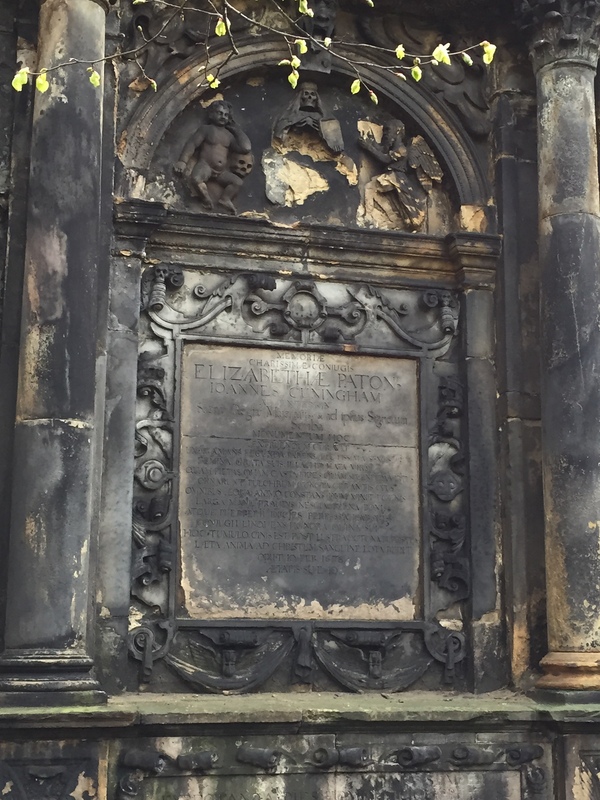 The most popular story about the Kirkyard is about Greyfriars Bobby (he even has a pub named after him!) Greyfriars Bobby was the loyal dog of Edinburgh police officer John Gray. When Gray died of turburculosis in 1858, Bobby decided that he would also move into the Kirkyard. He slept on Gray’s grave for 14 years, making him a somewhat of a local celebrity. When Bobby too met his end at the ripe old age of 16, he was buried in an unconsecrated patch of land so that he could sleep forever near his beloved master. How’s that for loyalty? Some plots had complete gardens surrounding them. You can see the castle in the background. 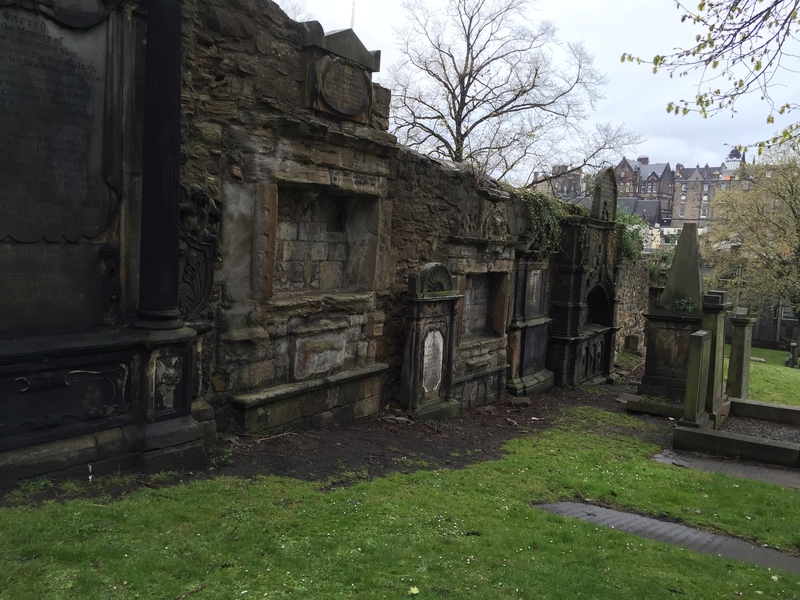 A view from the west side of the kirkyard looking north. I was a fan of this skeleton sculpture on the north side of the Kirk. Not to be outdone, Elizabeth had some sweet skull work added to her… mausoleum? Seriously now that I think about it, what are these death walls called? Do you know what these graves would be classified as? I always considered them to be the townhouse of the mausoleum world but I’m probably classifying them wrong. Let me know in the comments if you have the answer!